A BIG part of the Christmas season, for me, has been cookie baking. Growing up, my mom was always baking something. Cakes, cookies, brownies. She is an amazing baker! Another thing she was always good at was getting us in the kitchen to help out. Whether it be measuring flour, cracking eggs, stirring, she always involved us. So when I was thinking of what I wanted my "formed" cookie to be for today's "Tis the Season for Cookies" round-up, I wanted to do something that would involve all of your children, no matter what their age or ability. Then I saw a picture on Facebook for these adorable Corn Flake Wreath "Cookies". While these are not actually what I would describe as a cookie, it is something that everyone can be apart of and the result is absolutely adorable! I can't wait to share it with you so LET'S GET STARTED! *Prep Time: 20 min. *Cook Time: 10 min *Difficulty: Easy *Servings: 14 "cookies"
To begin, scoop out the corn flakes into a large mixing bowl. Make sure it is the biggest bowl you have. These next few steps are perfect for the older ones. In a 3 qt. sauce pan, melt the butter. Once the butter has melted, add the bag of marshmallows. With a rubber spatula, stir continuously until the marshmallows have melted and are smooth. Then, remove from the heat and add the food coloring. Stir until the marshmallow mixture is fully combined. Next, pour the marshmallow mixture over the corn flakes. Stir until all of the corn flakes are coated and green. This would be great for those middle-aged children. For this next step, EVERYONE can get in on the action! You will need to wash your hands, and make sure they are either covered with butter or cooking spray. Pull out palm-sized portions of the corn flake mixture and roll into a ball. Once you have pressed the ball of corn flakes down, take your finger and press through the middle. Next, mold the corn flake balls into wreaths. This job is probably a good one for the older children. Now the youngest get to step up to the plate once more by adding the "berries" to the wreaths. I used some leftover heart sprinkles from Valentine's day, but you can use Red Hots or whatever you have on hand. Adorable holiday "cookies" that the entire family was a part of making! I guarantee that of all the Christmas cookies you will make in your children's life, THESE will be the ones they remember, because these are the ones they made themselves. 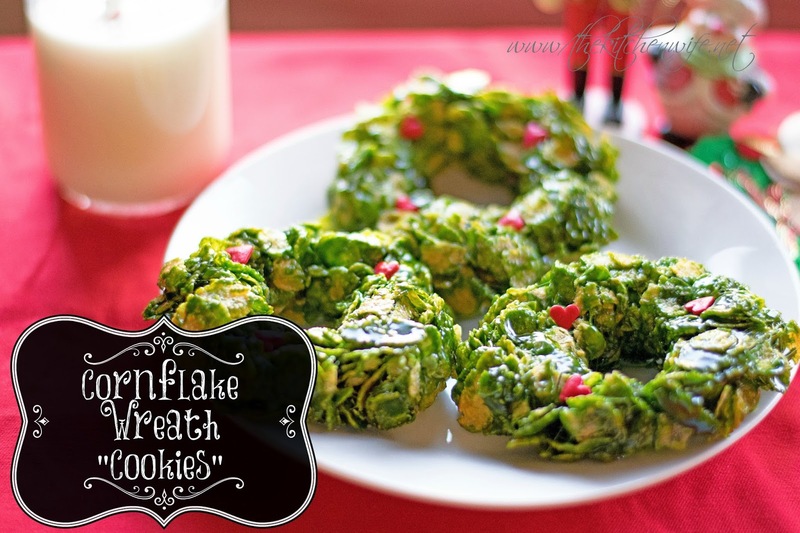 So this Christmas get your family in the kitchen with you, make these precious Corn Flake Wreath Cookies for Santa, and build memories and traditions your children will carry with them the rest of their lives! Scoop out the corn flakes into a large mixing bowl. Make sure it is the biggest bowl you have. Remove from the heat and add the food coloring. Stir until the marshmallow mixture is fully combined. Pour the marshmallow mixture over the corn flakes. Pull out palm-sized portions of the corn flake mixture and roll into a ball. You will need to make sure your hands are well greased for this. Once you have pressed the ball of corn flakes down, take your finger and press through the middle. 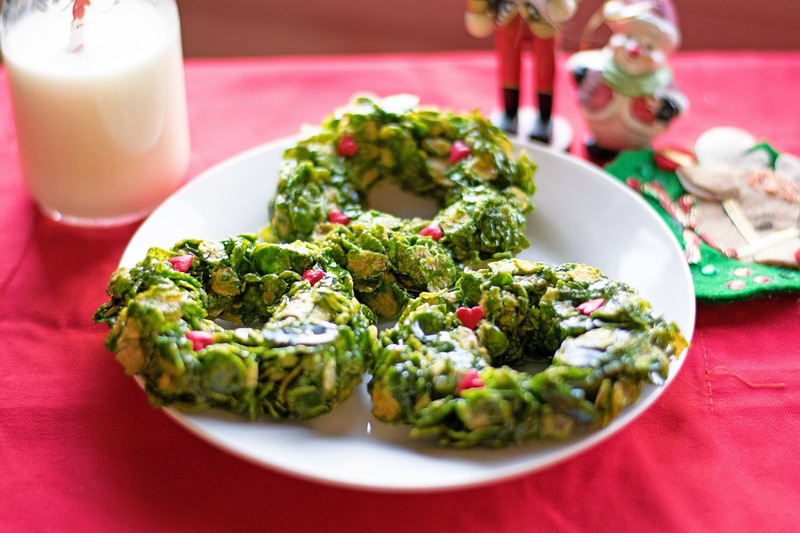 Next, mold the corn flake balls into wreaths. Add Add Red Hots or Large Red Circle Sprinkles for the berries. 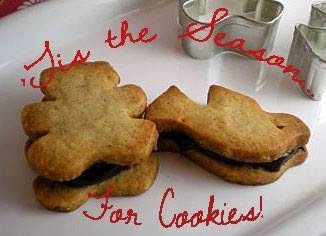 For more great holiday cookie recipe check out these great blogs that are also participating in this round-up!